Once per turn, you can also Xyz Summon "Cyber Dragon Infinity" by using "Cyber Dragon Nova" you control as material. (Transfer its materials to this card.) Gains 200 ATK for each material attached to it. Once per turn: You can target 1 face-up Attack Position monster on the field; attach it to this card as a face-up material. Once per turn, when a card or effect is activated (Quick Effect): You can detach 1 material from this card; negate the activation, and if you do, destroy it. This monster appears in the artwork of Infinite Impermanence. 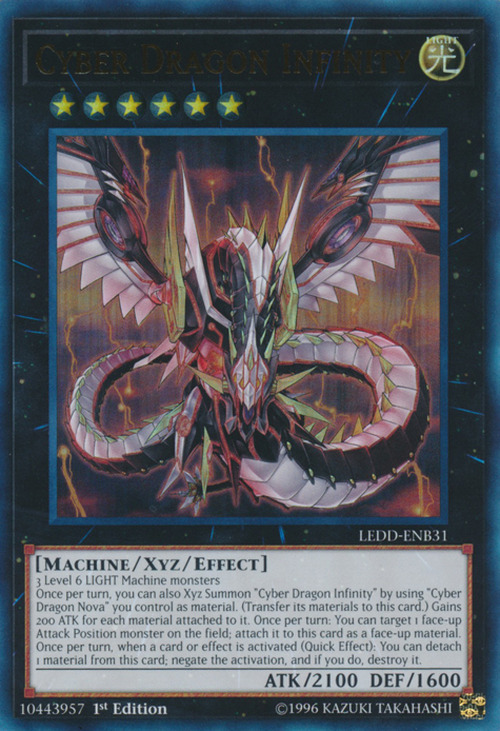 This card is the Xyz Evolution of Cyber Dragon Nova. Fittingly, this monster's tail is in the shape of an infinity symbol. This card is the first Xyz Monster that requires both Attribute and Type specific Xyz Materials. This monster's wings feature a head-like motif on their tips, which seemingly mirrors the three heads of Cyber End Dragon.